Getting ready to hit the gym? Before you lace up, take some advice from team Bodybuilding.com and make sure you're not committing one of these training blunders. We've all been there, seen that: The guy doing heaven knows what on a piece of fitness equipment; exercises where chest machines become lower-body blasters, rowers become some strange hamstring exercise, or pull-down machines cause people to yo-yo back and forth. Even if you haven't seen it in real life, you've likely seen gym fail videos online. While they're embarrassing, and sometimes downright cringe worthy, what's even more dangerous than all-out blunders are the subtle gym mistakes that put people at risk of injury or impede their goals. Gym mistakes happen, and some are even encouraged—how else are you going to know your squat PR or max box-jump height if you give up before you fail smart? However, avoiding unnecessary blunders is key to both sparing your ego and preventing bodily harm. Here to share with you the biggest mistakes they see people making in the gym are team Bodybuilding.com athletes. Pay attention to what they have to say, and then make sure that you aren't committing these crimes yourself. "The biggest mistake I notice in the gym is the overuse of cardio equipment for weight loss," says Dymatize athlete Brooke Erickson. When they want to drop pounds, most people's first inclination is to hop on the bike, elliptical, or treadmill to sweat out calories and feel the burn. Sure, cardio can help you spend energy, but lifting weights is what reshapes your body and leads to desired results. "I also notice that most women are fearful of lifting heavy because they are nervous about 'getting manly'," Brooke adds. Always remember that as a woman, you do not possess sufficient levels of testosterone to develop large amounts of bulk. Even building an appreciable amount of muscle takes a lot of time, energy, and calories, making it a slow and dedication-driven process. The belief that you'll wake up the next morning looking like She Hulk is pure fiction. Sometimes, getting to the gym is the biggest struggle of all. "I want to give props to anyone who trains," says BSN athlete Sara Solomon. "The biggest mistake I see being made is not training at all." The gym can be an intimidating place, especially if you're new, but heading in with a training program that fits your goals and seeking support from a like-minded community can be real confidence builders that help take guesswork out of the equation. Improper form is the biggest mistake that cover model Kathleen Tesori sees being made. "People often use too much weight and can barely complete a full set well," she says. "They rock to throw up the weights, which isn't an effective use of their time." Incorrect technique targets the wrong muscles and reinforces poor movement patterns. If you aren't quite sure how to do an exercise, ask someone who knows. Don't be afraid to approach a trainer—you might spare yourself an injury. NLA athlete Jessie Hilgenberg and Performix athlete Alex Silver-Fagan agree. "People should know not to increase the weight until they can properly perform an exercise with a full range of motion," Alex says. "Once you nail down the form and muscle isolation, then you can worry about adding weight," Jessie adds. It's always better to lift using good form and a lighter weight than to push your limits and get sloppy. "Proper programming is surely a big miss by most," says IFBB pro physique competitor Craig Capurso. 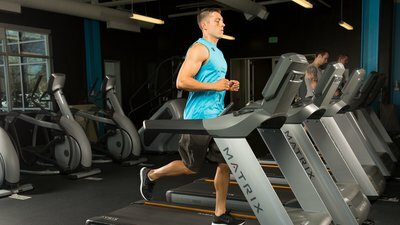 Rather than throwing together a program at random, or hopping from free machine to free machine, it's important to head into the gym with a plan. Your workout should reflect your end goal—whether that's building size, leaning out, or simply gaining strength. "People often follow a routine that lacks direction or doesn't target specific stimuli," Craig says. "Other times, they tweak their program instead of following specific instructions." You might think you're advanced enough to make some slight changes to a prewritten program yourself, but often that isn't the case. A few small alterations can change your results. "The biggest mistake I see people making is not giving their central nervous system a break," says fitness model Lawrence Ballenger. "People need to periodize their training so they don't get discouraged when they aren't making gains," he notes. After every eight weeks or so of intense training, schedule a week off for downtime and recovery. It's one of the best things you can do to ensure you keep coming back stronger than you were before. One of the top mistakes that NutraBio athlete Zane Hadzick sees when he enters the gym is people just going through the motions. "Don't fall victim to redundancy and leave your brain at the door," he says. "We all like routine, but if you stick to the same old program for too long and don't challenge yourself, you'll inevitably plateau." If you're bored with your workout and check out mentally, your progress will taper off until it's non-existent. Repetition is another big mistake that PEScience athlete Amanda Bucci sees. "Progressive overload is not emphasized enough when it comes to starting a fitness program," she says. "I see people doing the same three sets of 10-12 reps, with the same weights, every single week for months." When you're new to training, three sets of 10-12 reps will yield results. Eventually though, you'll need to either add more weight or additional sets or reps to continue progressing. While this blunder only applies to those wanting to take the stage and make fitness a career, it's still one that powerlifter Karina Baymiller sees. "A lot of new fitness models do nothing to separate themselves from the pack," she says. "There has to be something that makes you stand out and that draws people to you. If you're the same as everyone else, your career as a fitness model will likely be short-lived."